Anudinam Goshala is located in Nagapattinam, close to Sri Soundararaja Perumal Temple (19th Divya Desam among 108). It is also 2 km away from Nagoor town, where slaughtering of cows is a common practice. It causes great pain to helplessly witness the native breed cows being brought in hoards to slaughter houses, without realizing their value. We felt its our moral responsibility to protect our own mother cow. 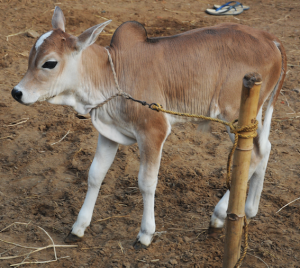 In our Goshala, the aim is to protect native cows, specifically Umbalachery cows belonging to Nagapattinam region, that are becoming almost extinct at a fast pace. Umbalachery cows are one among the six native breed cows of Tamil Nadu. Out of these six, Theni Malai Maadu (Theni region hill cows) are already extinct due to cross breeding with Jersy & HF cows. In general, native breed cows of Tamil Nadu are low milk yielding ones, but their produce is highly healthy. Since most of the cow farms are mainly focused on the income from selling milk, they host cross-breed cows, and as a result, the low yielding native cows are mostly abandoned or not properly taken care of or sent to slaughter houses. Even, most of the Goshalas, adopt cross breed cows for self sustenance. As a result, our native breeds, particularly Tamil Nadu breeds, are getting neglected. Our Goshala is a humble attempt to do our bit in safeguarding and protecting Tamil Nadu native breeds. To begin with, we have started with the Umbalachery cows. Of the remaining five Tamil Nadu native breeds, Umbalachery cows are the least milk yielding, and hence are mostly abandoned and prone to be sent to slaughter houses. Consequently, there are only 5,000 cows of this breed left among 198 million cows present in India. Further to ensure that the Umbalachery native breeds remain in the region they belong to, which is most suited for their survival, we have launched our first Goshala in Nagapattinam. We request everyone to participate in this initiative by contributing as much as they can for this dharmic activity. Please visit our donation page for further information.